MONSTER TRUCKOptions include: 6hp Electric Start Engine, Live Axle with Torque Converter and Disc Brakes in Product Options above. Make no mistake, this truck is no wall flower. Great for Kids, Corporate Promotions, Parades and more. We can add virtually any Graphics, Corporate Name or Logo. Choose one of ours, or email us your own. We can do it. Just select CUSTOM PAINT or CUSTOM GRAPHICS in Product Options above and we will contact you. If you want just the body, we can do that too. MADE-IN-USA. All of the Bodied Karts are built to 1/4 Scale of the original car, Indy Race Cars, Trucks, Antique Cars, Monster Trucks, Nascar , Sports Cars, Jeeps and even Tractor Trailers. All Body Karts are Custom Built for each customer. Please allow 2-4 weeks plus transit time for delivery. We can include any graphic or body color. All car and truck styles are GENERIC and are not associated with any licensed products or designated manufacturers.SPECSENGINE: 5HP - 4 cycle gas engine with recoil start standard. 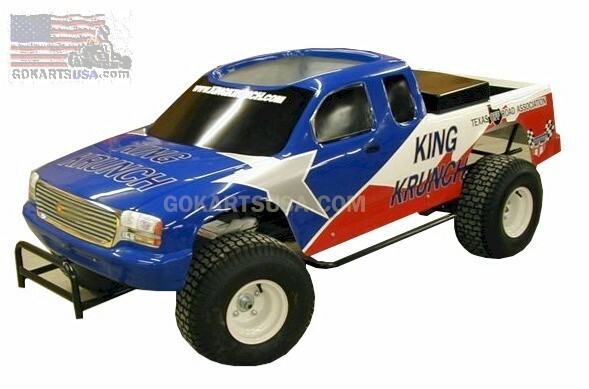 (Optional 6 HP Available with or without Electric Start)BODY: Replica fiberglass body in various colors. Standard Colors are: Red, Blue, Yellow, Green, Black, White TIRES: 4:10 x 3:50 x 6 tires and tube with mountable steel rims and sealed bearing hubs. CHASSIS: Precision jig welded all steel chassis painted black with extra-strength steel tubing. CLUTCH: Fully automatic centrifugal clutch with #41 chain drive sprocket and 6:1 gear reductions, or optional belt driven torque converter. GRAPHICS: Custom Vinyl replica multi-color graphics using state of the art computers and printing equipment (in house).HUBCAPS: Specially made rims allow for custom made, durable, carbon plastic hub caps on most models.SAFETY SWITCH: Driver operated safety on-off switch. Also, foot operated safety throttle and brake controls.BRAKES: 4" Band or Disc Brakes are installed on rear axle and pedal operated in front by a connecting straight rodCRATE SIZE: Length: 96" - Wth: 43" - Hght: 28" - Wgt: 230"SHIPPING: All orders will be shipped truck freight Paid in Advance. Shipping charge includes crate. All specifications are subject to change without notice or obligation.